This is an album that has tendencies from Melodic Death Metal, Death Metal in general and Thrash all mixed up into one. A female singer handles the vocals, which is one aspect that reminds me of the band Arch Enemy amongst others. The band has a groove that is very reminiscent of Arch Enemy more than any other band. I believe the style played by Diary About My Nightmares is enjoyable, but limited in its scope. Songs often have more in common with Melodic Death Metal than other sub-genres of Death Metal and have catchiness as one of the primary assets. Now, it isn’t to say that there’s no substance in this type of music, but don’t expect the level of depth of a band like Cynic either. Song structures have a heavy emphasis on melody and carry a good deal of passion to the forefront. Longer tracks like 'Close To The Border' try to bring an extra level of intricacy to the mix and partially successful in doing so. Others, like 'Hate', try to be more infectious in their approach. 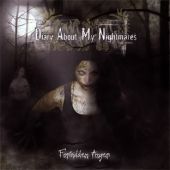 Regardless, Diary About My Nightmares offers an accessible take on the Death Metal genre and will probably be fairly easy to appreciate by many listeners. "Forbidden Anger" has good melodies and is easy to get into, but contains nothing overly spectacular. Fans of more Melodic Death Metal and bands like Arch Enemy will find this album very good as long as they expect the absolute highest standard in the world. "Forbidden Anger" shows enough emotion to create an album that’s listenable and worthy of some attention.